The slow cooker and I have a seasonal relationship. In early Autumn we greet one another like long lost friends and set about sharing some very productive times together. As winter descends our partnership strengthens as we work together ever more closely, exchanging smug glances and proudly patting one another on the back as each lovely braise, curry or soup develops. However, by September 1, we are so bored in each other’s company we cannot bear the sight of one another. If either of us has to deal with another diced onion or budget cut of meat we’ll shriek. We retreat to separate areas of the home, the cooker in the hall cupboard, me to the barbeque. Occasionally over the summer when the cupboard door opens, we catch sight of one another and glare, as not enough distance or time has elapsed to make our hearts grow fonder. Now as the leaves begin to colour and an extra layer overnight is required, we seek each other out with renewed interest to begin another industrious season in the kitchen together. The secret to keeping things fresh with the slow cooker is to change it up a bit each year. Repeating old favourites is fine to point, but as cooks we evolve and as diners our palates change. There are certain staples the cooker is renowned for: lamb shanks, beef casserole, chicken curry and the like but if you want to keep this appliance relevant, it needs to move with your current dietary preferences. Today I have had a pork shoulder rubbed in paprika and coated with a mix of tomato, brown sugar, hot chilli sauce, apple cider vinegar and chilli flakes languishing in the cooker for 8 hours on low. A slaw of cucumber (current garden glut), carrot shred and coriander, dressed with apple cider vinegar, lime juice, honey and toasted sesame seeds, will sit nicely with this pulled pork inside some warmed wraps. I cannot think of a nicer Saturday evening dinner right now – and there will be plenty left for tomorrow. My forward plan for the cooker this season includes gently cooked fish parcels and steamed dessert puddings. This is a way of using the cooker’s traditional technique, but for shorter periods, as these dishes will only take 2-3 hours at most. Using the cooker this way, frees up the oven for other food, or simply allows you to cook without constant supervision. I have never really considered using my cooker as a dessert oven and thoughts of a fruit pudding simmering away quietly in the background while the main meal is underway is quite appealing. Of course, like so many households, ours is one of an ever-changing combination of occupants, who dine at various times around the clock. Having a pot of soup on hand and a lovely loaf will always cater for these out of hours diners. The slow cooker is perfect for this, and so I intend to broaden my soup repertoire this year. 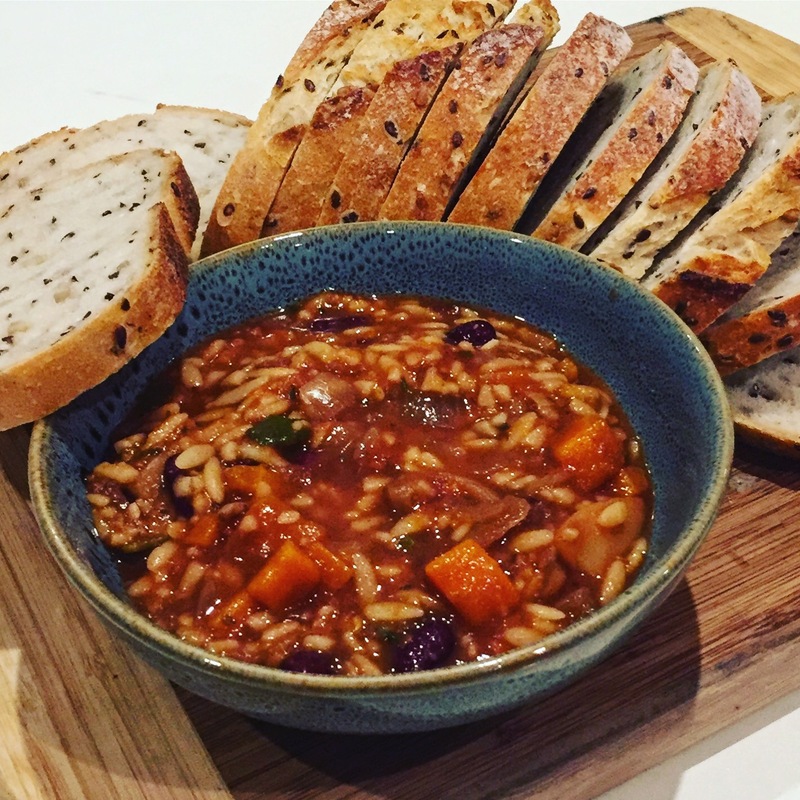 So to kick this off, spurred on by all of the current ‘research’ around the benefits of the Mediterranean diet and wanting to have a hearty soup underway, my oval partner and idea produced a delicious minestrone which we paired with some lovely seedy sourdough. Looks as though the relationship for 2017 is off to a great start. 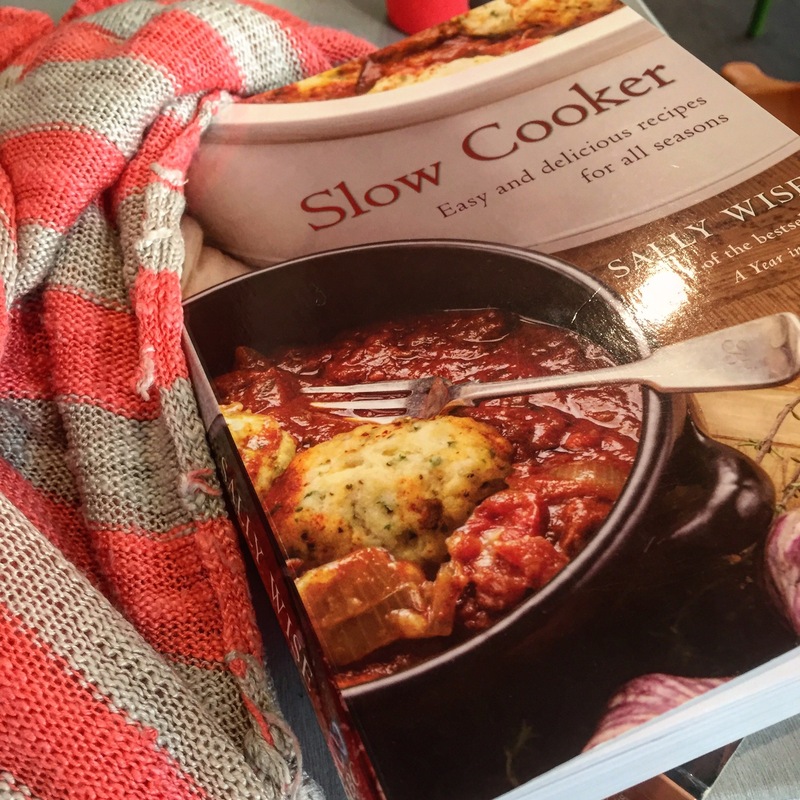 This recipe is an adaptation of one from Sally Wise, who has written some fabulous slow cooker gems. This particular soup is from Slow Cooker – Easy and Delicious Recipes for all Seasons.